Nangpel was born to Polish and Mexican parents. Her maternal grandmother was a Holocaust survivor: one of the few survivors within her family. Nangpel was raised in Mexico in a large family. She began studying Spanish literature at UNAM (National Autonomous University of Mexico) and then shifted to the study of law, in which she earned her BA. As part of her deep social commitment, Nangpel worked for 13 years as a researcher in the National Anthropology and History Institute INAH. Nangpel first encountered the Dharma in the Theravada tradition, where she practiced meditation seriously for two years. 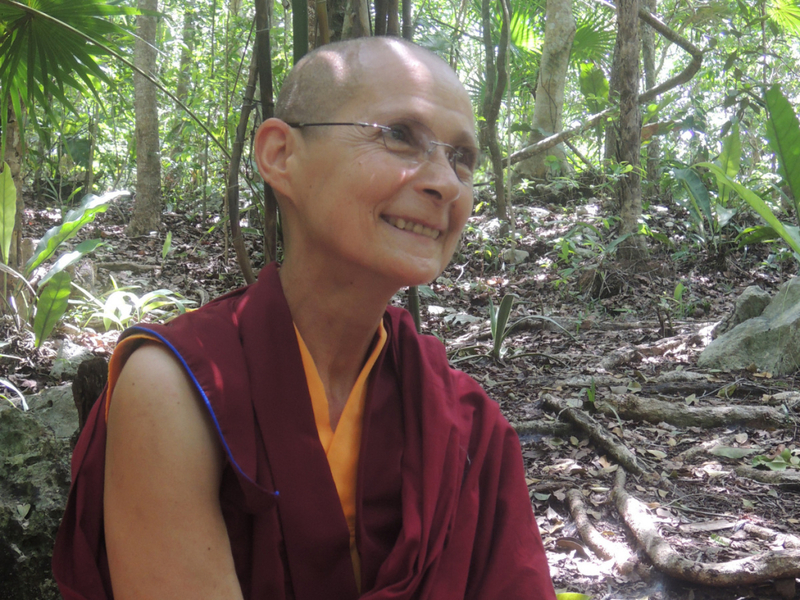 Her engagement with Tibetan Buddhism began in Xalapa, Mexico, where she met Geshe Thabkay of Deer Park Monastery in Madison, Wisconsin. She began traveling to Deer Park to attend the summer courses in Buddhist philosophy taught by Geshe Lhundup Sopa. Over the coming years, she co-translated the Sanghata Sutra into Spanish, as her commitment to her spiritual path intensified. With the intention of seeking monastic vows, she traveled to India with Damchö, with whom she stayed preparing for her ordination. At the end of 2007, she met His Holiness the Karmapa, at the same time as she and Damchö met Dapel, and weeks later Nangpel went forth as a Buddhist nun, receiving her shramanerika vows from His Holiness the Dalai Lama in 2008, in the same ordination ceremony as Dapel. Nangpel is a founding member of the Dharmadatta Nuns’ Community and lived in India from the time of her ordination. She traveled annually to Nepal to participate in the study program at Pullahari monastery, and has undergone intensive meditation training, having received the Ocean of Certainty transmission from Tai Situ Rinpoche over the course of six years. This course of training in meditation requires two hours of daily meditation using specific techniques, and culminates in Mahamudra meditation. 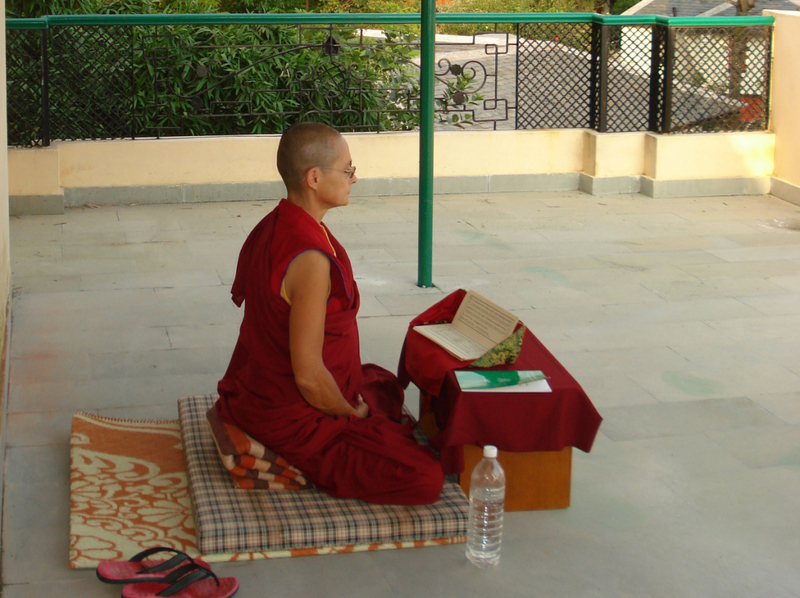 Her first translation assignment as a nun was Nagarjuna’s Letter to a Friend, which she and Damchö translated together from Tibetan into Spanish for the annual teachings by His Holiness the Karmapa during Kagyu Monlam in Bodhgaya in 2009. Over the subsequent years, she has translated a number of other texts into Spanish, including two books by His Holiness the Karmapa: Por el camino de la compasión (Editorial Tiempo Nuevo) and Ojos que jamás se cierran: El cultivo de la compasión (Editorial Albricias). Along with continuing her own meditation practice, Nangpel helps lead retreats and regularly guides meditations in Spanish. She serves on the editorial team of Editorial Albricias and collaborates with Instituto Budadharma creating didactic material for its online study program. The “Ninja Nun” has a son and a granddaughter, who live in Mexico City.